Seattle Opera Blog: Caption-Writing Contest Winner! You can check out all the clever suggestions about what Marcellina and Susanna might be discussing here.
" 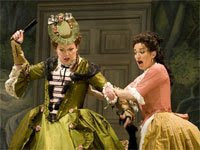 Die Fledermaus, I thought you said deflate her blouse"!! !